Halloween is all about fun — complete with cool costumes, tons of candy, haunted houses and trick-or-treating. So don't let potential eye dangers get in the way of all the Halloween thrills. It's OK to wear vampire teeth, don a witch hat or practice your zombie walk, but don't put your eyes at risk with non-prescription contacts and unsafe eye makeup, recommends the Bascom Palmer Eye Institute. Wearing non-prescription contacts and being reckless with eye makeup can pose serious threats to eye safety. Make sure your Halloween costume — and your child's — is as safe as it is spooky. 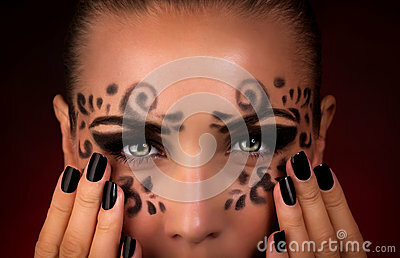 Some trick-or-treaters opt for colored, non-prescription contacts to complete their ghastly getup. But they may not be making a safe choice for their eye health. According to the American Academy of Ophthalmology (AAO), wearing non-prescription contact lenses can cause serious eye damage, including keratitis — inflammation of the cornea — and may even lead to permanent vision loss. Costume contacts often don't fit correctly. Forcing contacts that aren't the correct size into the eye can cause cuts and open sores on the eye. "I had several patients who sustained significant and permanent vision loss from wearing non-prescription contact lenses and then developed complications," said Christopher Quinn, OD, FAAO, optometrist at Omni Eye Services, in an interview with dailyRx News. "Contact lenses need to be carefully fit to the individual wearer and indiscriminate use of non-prescription contacts lenses as part of a costume is short-sighted and potentially dangerous." Other dangers of non-prescription contacts include pink eye, allergic reactions and swelling of the eye. The AAO noted that places like costume shops and party stores are not licensed to sell contact lenses, so purchasing lenses from these retailers can be dangerous. The safest bet is to skip the non-prescription lenses altogether. If your costume just won't be complete without some bright red werewolf eyes, you should at least take a few precautions. Only buy contacts from an eye care professional like an ophthalmologist or a retailer who requires a prescription and sells products approved by the US Food and Drug Administration (FDA). If you don't already have a contact lens prescription, get a valid prescription and eye exam from an ophthalmologist or optometrist who can provide guidance and instruction on proper handling and cleaning of contact lenses. Follow the directions for cleaning, disinfecting and wearing the lenses. If contacts are left in for too long or not properly cleaned, the risk for an eye infection can increase. Do not share contact lenses with another person or wear contact lenses that have expired. If you notice redness, swelling, excessive discharge, pain or discomfort from wearing contact lenses, remove them and seek immediate medical attention. Eye infections like keratitis can quickly become serious and cause blindness if left untreated. Colorful makeup might make you a more convincing scary clown, but it might also endanger your eyes. Thick coats of makeup around the eyes can get into the eye during the course of a night spent trick-or-treating — or even when you're removing the makeup. Children's Hospital Los Angeles (CHLA) recommends only using makeup approved by the FDA on the face or around the eyes. Unapproved costume makeup may contain ingredients that could pose further eye risks like infection or irritation. To remove makeup, CHLA suggests using cold cream instead of soap and water. If makeup gets into the eye, rinse it with cool water by tilting your head back while you pour water into your eye. If pain or redness persists after you have rinsed your eyes, seek medical care. If you or your child plans to be a swashbuckling pirate or gallant knight, leave the sword at home — or settle for a fake one. The CHLA recommends avoiding pointy props for your costume. If the sword is a must, make sure it's made out of soft, flexible material. These materials are often used in props at Halloween costume shops. Also, be sure to include a belt carrier or protective case like a sheath in your costume. That way, you minimize the risk of accidentally poking your eye or someone else's — and you keep your candy-grabbing hands free.